To make the Vegan Indian "Meatballs"
Grate the zucchini, carrots, and bell peppers using the coarse side of a box grater (or with a food processor). Place the vegetables into a fine mesh strainer held over a mixing bowl to allow the excess moisture to drain. Drain the vegetables for at least 30 minutes. Reserve the vegetable liquid for use in preparing the Coconut Curry Sauce. In small quantities place the vegetables into tea towels and wring out all excess liquid. Place the prepared vegetables into a mixing bowl and gently stir with the green onions, cilantro, red onion, jalapeno, ginger, salt, Old Bay, black pepper, and cumin. Gently stir in the flour, adding just a bit more if the mixture seems to loose. Portion the vegetable mixture into 32 meatballs, lightly roll into a sphere shape. Place the vegan meatballs onto a parchment lined baking tray. Cover the baking tray with plastic wrap and refrigerate for at least 1 hour to allow the vegan meatballs to become firm. Heat a sauce pot with the vegetable oil to 350ºF. In small batches, fry the vegan meatballs until golden brown; carefully remove the meatballs from the deep fryer and place onto an absorbent paper lined tray. Reserve in a warm area while cooking the remaining meatballs. Heat a sauce pot with the vegetable oil over medium heat. Add the red onions and shallots and cook until just fragrant and have not browned, approximately 30 seconds. Add the ginger, coriander, cumin, garlic, turmeric and cayenne and cook for about 1 minute while gently stirring with a wooden spoon. Stir in the coconut milk, tomatoes, and lime juice, reduce the heat to low and simmer for 10 minutes. Add 2 cups of the reserved liquid from the strained vegetables and continue to simmer for 20 - 30 minutes or until the sauce has reduced to a medium consistency. Add the cilantro, garam masala, and salt and simmer for 2 minutes. Heat a sauce pot with the vegetable oil over medium heat. Add the shallots and ginger and cook for 30 seconds, or just until fragrant. Stir in the water, rice, lemon zest, salt and cumin. Tightly cover the pot with a lid, lower the heat to a simmer and cook for approximately 15 to 18 minutes or until the rice is fully cooked. Remove the pot from the stove and lightly fluff the rice with a fork. Lightly cover and set in a warm area to rest for 5 minutes. Evenly ladel the Coconut Curry Sauce into 8 warm decorative serving bowls. Place a cup of the Lemongrass Scented Basmati Rice in the center of each bowl. 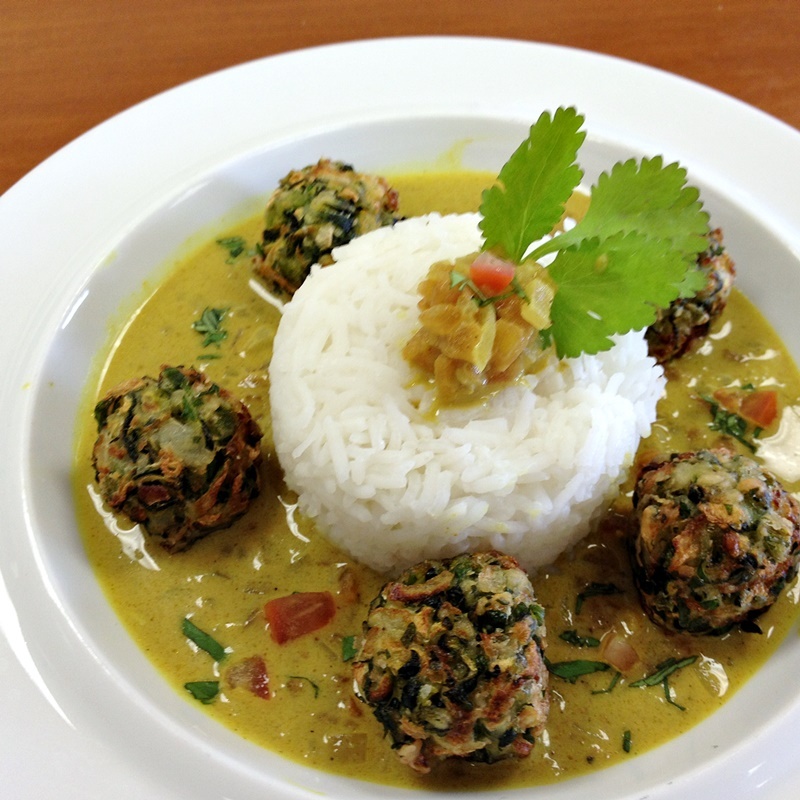 Symmetrically arrange 4 Vegan Indian "Meatballs" around the perimeter of each serving of rice. Garnish each serving with a wedge of lime and a sprig of cilantro.